With Cloud Backup, Disaster Recovery and Business Continuity from Aruba Cloud, you can immediately reduce the risks involved in processing personal data. 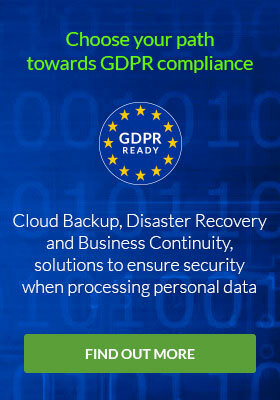 With Cloud Backup, you can create automated backups and respond to specific data processing security measures as stipulated by the regulation. Transfer via an encrypted SSL channel to avoid the unauthorized disclosure of, or access to, personal data transmitted. AES encryption with option to encrypt the content in storage with AES-256 that “ensures appropriate security of the personal data”. This hallmark confirms the compliance with the CISPE Code of Conduct, and guarantees the freedom to store and process data within the European Economic Area. Disaster Recovery as a Service (DRaaS) lets you create copies of data both within your company and in the Aruba Private Cloud in a VMware environment. Redundant storage at different data centers in the Private Cloud infrastructure to guarantee the “resilience of processing systems and services”. The production workload switches to the disaster recovery site in a matter of seconds to “restore the availability and access to personal data in a timely manner”. Possibility of carrying out disaster recovery tests for “regularly testing, assessing and evaluating the effectiveness of technical and organizational measures”. Aruba's Business Continuity solutions are based within its own European network of data centers that continues to grow. Aruba's data centers let you organize Disaster Recovery and Business Continuity procedures capable of dealing with any eventuality, as required by the regulation. Redundant fiber optic connections between Aruba-owned data centers in Italy (IT1, IT2 and IT3) with multiple interconnections between the European data centers in the Private Cloud infrastructure (FR1, CZ1 and PL1). Preventative recovery procedures depending on the service level required and the “risks that are presented by processing” personal data. Recovery options that can be configured according to the specific situation and the “context and purposes of processing”, as well as the specific requirements in terms of the infrastructure of individual customers. I confirm I am at least 18 years old according to the regulations in force in the state where the service provider is based. Your data within our infrastructure is completely under your control. The data you put on our cloud is not accessed nor used in any way: we won't sell your data to third parties or trade in your data. All of this is guaranteed and certified as our services comply with the CISPE Code of Conduct. 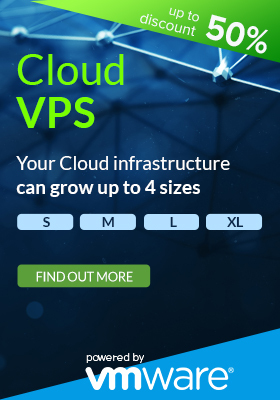 Our European network means you can choose from 3 data centers in Italy and 5 more in Europe: you can activate your cloud services in a matter of minutes in any desired infrastructures. Our Milan PSP and Arezzo data centers boast the highest levels of certification for resilience and infrastructure quality stipulated by the ANSI/TIA 942-A standard. Our cloud infrastructure is not subject to US laws and regulations, such as the Patriot Act or the FISA (Foreign Intelligence Surveillance Act), which impose measures allowing access to data and information, with a significant effect on privacy. 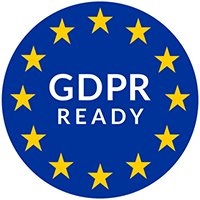 Compliance with certain security standards in the management of company data and information, preserving its integrity, confidentiality and availability. All Aruba Data Centers are equipped with advanced logical and physical security systems (surveillance, monitoring, backup power supplies and redundant systems).